Welcome to Enviro Smog, Stockton's Star-Certified Smog Check Station! Welcome to Enviro Smog, where we pride ourselves on providing quick, courteous, convenient service while you wait. We have three oversized bays, which will accommodate even large RVs. Most tests can be completed in less than fifteen minutes while you wait in our clean, air-conditioned waiting room. No appointment necessary! Enviro Smog is Star-Certified Smog Check Station. This means that any vehicle can come for a state-approved smog test. We test all types of vehicles. 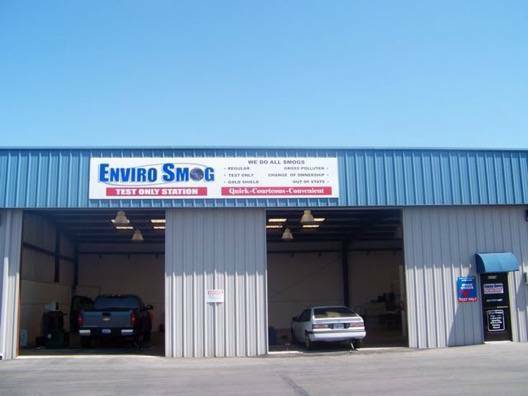 So no matter your vehicle’s smog needs, Enviro Smog can provide the necessary smog test! All Enviro Smog employees are ASE certified, and licensed by the State of California to perform all smog checks. Because Enviro Smog does not provide repair services, there is no motive to sell you expensive, unnecessary repairs. Other Smog Stations advertise a low price to get you in the door. Then they tack on lots of fees, so that the final price you pay is much higher! Here at EnviroSmog, our final price beats the competition!